The field of health and medicine is continually evolving and your preparation for the study and practice in this field is a continual process. To guide you better, we designed the Health Careers Portfolio in ASK, an excellent tool to help you reflect, prepare, and track your accomplishments, as well as areas for improvement. The Health Careers Portfolio in ASK is designed to promote self-reflection and to help track your coursework and co-curricular activities related to your health careers aspirations. Every year early in the fall semester, you will complete a portfolio questionnaire. Your answers will help you to assess and plan ahead. It will also help us get to know you better so we can provide you with targeted guidance during your time at Brown. Exploring the health professions and developing a well-rounded record takes time, energy and effort. You will be a stronger applicant if you follow the guidance presented in the questionnaires, think carefully about your strengths and areas for improvement, and answer truthfully the self-assessment questions. Getting to know yourself better is one of your main goals as a college student. Articulating your passions and interests can sometimes be difficult because doing so requires you to take a step back from your busy schedule. Your portfolio enables you to do just that by helping you evaluate your accomplishments, identify your interests and plan your own growth. Each year you will look back at your previous years' questionnaires and self-evaluations to see how far you have come and plan your next steps. You will soon be able to upload your own materials to your portfolio- whether a paper you wrote on public health issues, or a journal article that you found informative. 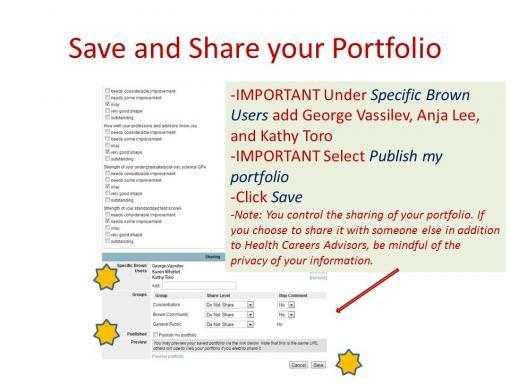 In the future, the Health Careers Portfolio will also house all health careers application forms and letters of recommendation submitted by your faculty and mentors. First-Year and Sophomore students: we recommend you consult the First-Year and Sophomre Students as well as the Health Professions Personal Competencies pages as you complete the Health Careers Portfolio so you make informed connections between your record and aspirations on the one hand and health professions schools' expectations on the other. Juniors, seniors and alumni: we recommend you also consult the Applicants (and/or Re-Appliants) pages in addition to the pages referenced above. Step-by-step instructions for creating your portfolio and completing the questionnaire are provided below. Set up your Portfolio and complete the questionnaire for your current year by the end of October. The Health Careers Portfolio will be described in detail during First-Year and Sophomore Information Sessions throughout the year. We look forward to getting to know you better through your Portfolio.